What kind of public space we would like to have in 21st century? How can we relate to strong story, that has started here in last century with velodrome construction? What kind of space can reflect all the different area residents and external visitors? Recent remediation of old velodrome did not take anything from its strong identity. In those couple of years without any artificial maintenance, natural regeneration supports the site becoming wild. We would like to support this sustainable way of design and not to design anything that does not relate with this site. We frame this site with more urban like garden with urban activities like café, children playground, petanque, table tennis, grill and we experiment with urban farming and beehives, short alley and shared space. Former velodrome track is being kept in natural form and it is framed from bottom side with multifunctional road that connects different activities. In the middle of the park, rain garden keeps its place with some green that creates shadow. Big multifunctional lawn is being kept for different non specific activities and recreation. Site is well connected with other city parks, green and sport activities. We are not designing anything. We let the nature to design itself. By mapping of site topography and nature, we get different density of pixels that are translated into plan. Topography creates natural areas for rain garden that is used for sustainable water treatment. In first phase we allow to transform existing building into little offices that invites young artists and STARTUP companies. New garden will function as urban oasis for those people, who need to restart their minds, to gain new energy for their ideas. In second phase, we propose to build a new building with underground parking for 100 cars, which can economically help to maintenance the garden. New café and water pavilion is planned for this phase as well. 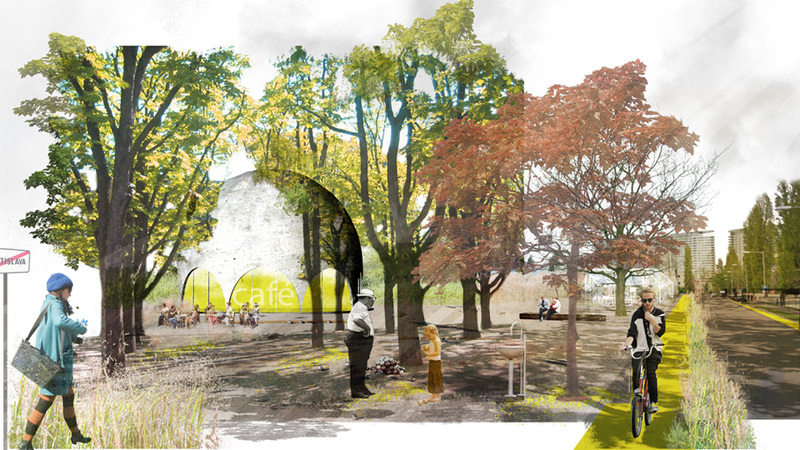 New park and garden is going to provide a space for mind restart and offer a place to hide from chaos of the city.